American Red Cross regional CEO Patricia Smitson, Ohio Casualty Insurance senior VP Robert Dodson and Cincinnati Red Cross board chair Chris Froman. 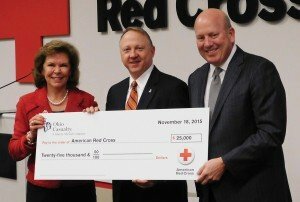 Ohio Casualty Insurance Foundation presented the Red Cross with a $25,000 grant for its Service to the Armed Forces program. SAF provides care to the members of the armed forces, with a focus on entry and deployment, building family resiliency and serving the wounded. The program provides assistance to veterans, active duty military and their families.